There are many Russian graves in the old cemetery of Menton, as there are many British. 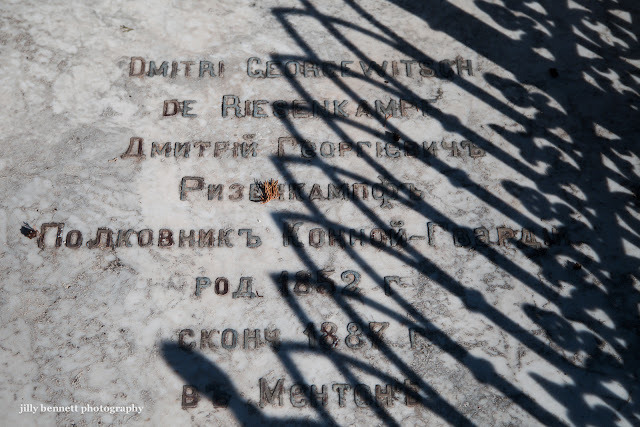 Dmitri was born in 1852 and died in 1887 - he was 35 years old. The letters are rusting, the shadows hang low. Il y a beaucoup de tombes russes dans le vieux cimetière de Menton , et beaucoup de Britanniques aussi. Dmitri est né en 852 et mort en 1887 - il avait 35 ans . Les lettres sont rouillés, les ombres descendent bas. I would have assumed that the Russian population along the Riviera would have grown in the years after the 1917 revolution and the end of World War I. It looks like there was a Russian community there earlier. They must have been escaping the weather even before the Bolsheviks. Quelle est la différence entre le génie informatique et l'informatique?